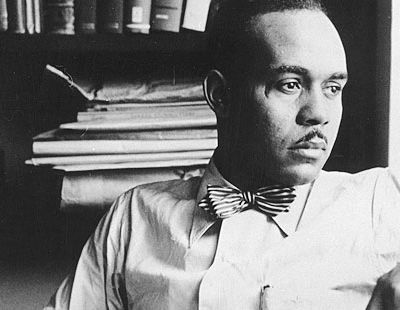 In writing INVISIBLE MAN in the late 1940s, Ralph Ellison brought onto the scene a new kind of black protagonist, one at odds with the characters of the leading black novelist at the time, Richard Wright. If Wright’s characters were angry, uneducated, and inarticulate — the consequences of a society that oppressed them — Ellison’s Invisible Man was educated, articulate, and self-aware. Ellison’s view was that the African-American culture and sensibility was far from the downtrodden, unsophisticated picture presented by writers, sociologists and politicians, both black and white. He posited instead that blacks had created their own traditions, rituals, and a history that formed a cohesive and complex culture that was the source of a full sense of identity. When the protagonist in INVISIBLE MAN comes upon a yam seller (named Petie Wheatstraw, after the black folklore figure) on the streets of Harlem and remembers his childhood in a flood of emotion, his proclamation “I yam what I yam!” is Ellison’s expression of embracing one’s culture as the way to freedom. For Ellison, unlike the protest writers and later black separatists, America did offer a context for discovering authentic personal identity; it also created a space for African-Americans to invent their own culture. And in Ellison’s view, black and white culture were inextricably linked, with almost every facet of American life influenced and impacted by the African-American presence — including music, language, folk mythology, clothing styles and sports. Moreover, he felt that the task of the writer is to “tell us about the unity of American experience beyond all considerations of class, of race, of religion.” In this Ellison was ahead of his time and out of step with the literary and political climates of both black and white America; his views would not gain full currency until the 1980s. In his own life, Ellison’s interests were as far ranging as his “integrative” imagination. He was expert at fishing, hunting, repairing car engines, and assembling radios and stereo systems. His haberdasher in New York said that he “knew more about textiles than anyone I’ve ever met,” and his friend Saul Bellow called him a “thoroughgoing expert on the raising of African violets.” He was also an accomplished sculptor, musician, and photographer. The scope of Ellison’s mind and vision may have contributed to the growing unwieldiness of his much-awaited second novel, which he toiled over for forty years. He planned it as three books, a saga that would encompass the entire American experience. The book was still unfinished when Ellison died in New York in 1994 at the age of eighty. INVISIBLE MAN and the essays in SHADOW AND ACT and GOING TO THE TERRITORY were transformative in our thinking about race, identity, and what it means to be American. On the power of three books, Ellison both accelerated America’s literary project and helped define and clarify arguments about race in this country. Ellison’s outlook was universal: he saw the predicament of blacks in America as a metaphor for the universal human challenge of finding a viable identity in a chaotic and sometimes indifferent world. The universality and accomplishment of Ellison’s writing can be seen in the breadth of his continuing influence on other writers, from Toni Morrison and Charles Johnson to Kurt Vonnegut and the late Joseph Heller. Fifty years after the publishing of INVISIBLE MAN, Ralph Ellison’s voice continues to speak to all of us. A DVD of “Ralph Ellison: An American Journey”, containing an additional hour of video commentary and analysis can be purchased from California Newsreel.